Fragment of a quite large, deep vessel with an everted lip. 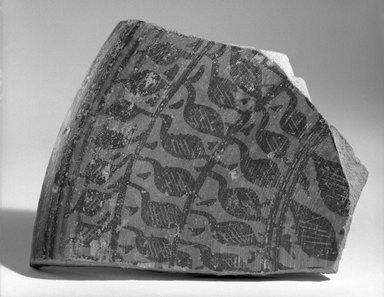 Reddish pottery painted on the inside with a design of horizontal rows of stylized leaves (?) in black on a red ground. On the lip is a scalloped pattern in the same technique. The paint has been rubbed in a number of places and the surface is chipped.